(PRLEAP.COM) Broadcasters and podcasters on the go have a powerful new tool for their remotes, one that allows them to create a professional, music-enhanced audio segment by just calling-in on a smartphone from the road. Backbone HUB™ is a cloud-based service that automates the entire process of taking a dry voice recording, like from a LUCI® app, adding the music bed, appending a pre-roll and/or ads, and publishing it to your favorite platform, such as "smart speakers" like Amazon's Alexa®, to your podcast host, or even to your AM/FM affiliate. Nobody else is required, nor is any special equipment. You are able to get on the air in one step, faster, cheaper and in full fidelity-with a prerecorded intro, complete with music. Backbone Hub enables any broadcaster or podcaster to dynamically augment and update their programming with scheduled or impromptu shows or segments without having to invest in expensive remote equipment or hire additional personnel for the purpose. Hub is always ready to create the next installment whenever the opportunity arises, regardless of time or day. Backbone Hub was originally created for major league sports broadcasters to easily augment their live programming with an array of on-demand audio platforms. While simplifying their podcast workflows, Hub enables users to reach out to newer, expanding platforms, including Amazon Echo and Google Home devices. It also schedules the delivery of studio-quality audio FTP delivery to the automation systems of their affiliate AM/FM stations. Backbone Hub is one more element in Backbone Networks Corporation's complete cloud-based radio station infrastructure (software as a service, SaaS). 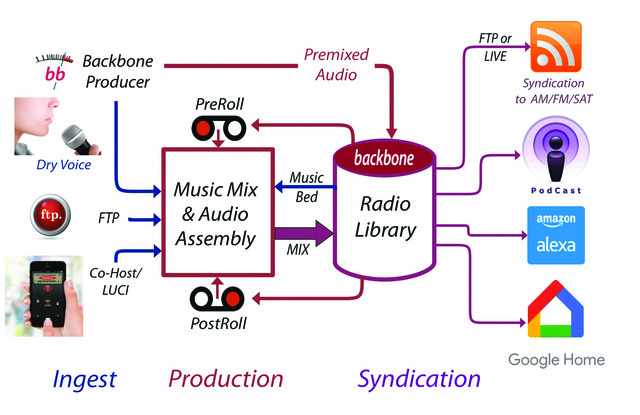 The Company offers a full complement of live radio, automation, and streaming (Backbone Radio™); talk radio communications, including multiline phone systems (Backbone Talk™) integrated with studio-quality remotes for remotes and collaborative broadcasts (Backbone Co-Host™); and automated cloud syndication of live online broadcasts (Backbone Syndicate™). Backbone Hub provides the on-demand component as stations expand their listenership with time-shifted audience engagement. Backbone Networks Corporation is a small, privately-held Massachusetts company specializing in the development of online broadcasting. Backbone created and hosts the largest network of online college and high school radio stations, as well as commercial stations for sports, talk and news, including major sports leagues and teams and metropolitan newspapers. The Company also provided television IFB technology for coverage of this year's Super Bowl and Olympic games.